A successful electronic poster presentation is not achieved overnight. If you want to prepare a well-organized and visually-pleasing electronic poster presentation, it requires you to plan it ahead of time. The first thing that you have to do is consider the audience and decide what kind of electronic poster you are going to create. Then, you have to gather the supplies needed and decide what information you are going to include in your electronic poster presentation. On this basis, you have to create the text and the graphics. Finally, you have to consider how these work together, and afterward format your electronic poster presentation according to them. What is an electronic poster presentation? 1 What is an electronic poster presentation? First of all, we need to answer this question — what is E-poster (electronic poster)? An electronic poster, or E-poster, is basically a poster submitted as a PDF presentation. What does it mean? It means that electronic poster presentation is the one that is presented on a computer screen during a congress and not on a regular poster board. During the congress, there will be 2 to 3 computer distributed among the congress exhibition area. 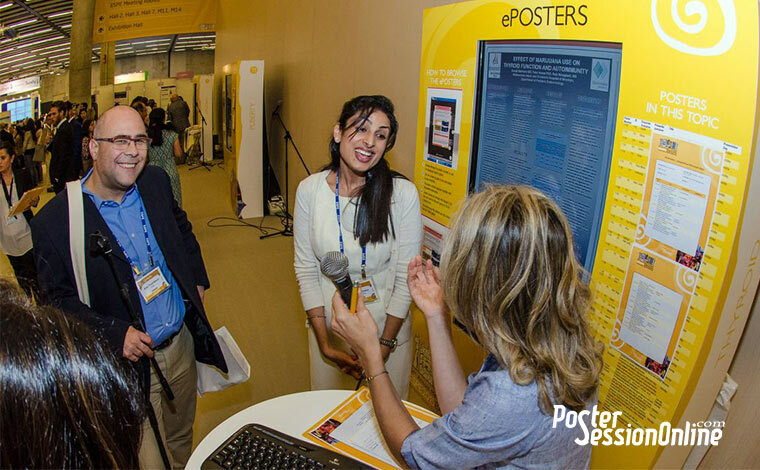 The E-poster system allows every conference attendees to see all the electronic poster presentations perfectly. It also allows you to look for presentations by the author name, the abstract title, and the topic. Moreover, it enables you to save a presentation on site either on external memory or send it by e-mail. 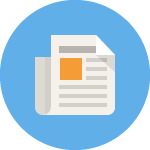 The E-poster that you upload must provide the same title, order of authors and affiliation details as the submitted abstract. Now that it is clear what an E-poster is, let’s see the steps we have to follow to create an effective electronic poster presentation. 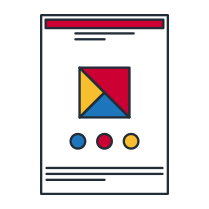 First of all, we need to build the e-poster, and that means choosing the poster dimensions — all electronic poster presentation should be in a vertical position — and the free poster templates. There is a wide variety so you can choose the one you like the most. The poster size must be set up to the one specified for the Congress. Just in case you have got al oldest version, like PowerPoint 2000, an automatic menu will be displayed. Then, you have to choose a blank slide and a blank template. Once you have created the file, click on File/Save, and enter a name. The next step will be set up the size of your poster. Click on File/Page Set Up and enter the size specified for the Congress. If you want to see the poster instructions on our webpage, click on “Build a Poster”/”Select a Template”. If you want to change the text properties, first select the text, and then use the top toolbox to change the font, the size or the color. To change more properties of the text box, such as frames, borders and so on, you have to click with the right mouse button on the text box and select “text box properties”. You can also change the position of the text box by clicking on the “Position” tab in the next box properties or dragging it with the left mouse button. To copy text from Word and paste it on PowerPoint you have to select the text that you want to copy and then, with the cursor on the selected text, click with the right mouse button and select “copy”. To paste it, you just have to click with the right mouse button on the text box and select “paste”. To change the size of the text box click and drag with the left mouse button one of the little points the box has got around it. Then move it where you wish. If you want to insert geometric shapes and arrows, you just have to click on insert, then on the image and finally on auto shapes. Once you open PowerPoint you will see a blank slide. Click on the Microsoft icon located on the top left corner and choose “Save”. Then select a folder in your computer to save the file, and enter a name. The next step will be to configure the page by clicking on Design /Page Set Up and enter the right size according to the Congress specifications — for instance, 90 x 120 cm. If you want to see the poster instructions on our webpage, click on “Build a Poster”/”Select a Template”. If you want to change the text properties like the font, the size or the color, you have to select the text and change its properties in the top toolbar. To change more properties of the text box, such as frames, borders and so on, you have to click on “format shape”. To change the position of the text box, click on the text box properties, and then format shape. To copy text from Word and paste it on PowerPoint you have to select the text that you want to copy and then, with the cursor on the selected text, click with the right mouse button and select “copy”. To paste it, you just have to click with the right mouse button on the text box and select “paste”. To change the size of the text box click and drag with the left mouse button one of the little points the box has got around it. Then move it where you wish. If you want to insert geometric shapes and arrows, you just have to click on insert and then on shapes. If you want to know how to create graphs or tables, you will find all the information on our webpage. These tips are intended to create a well-designed poster. Nevertheless, you don’t have to follow them strictly. You can feel free to design your poster as you want. The title of the poster should be the most visible part of it. So we recommend you to center it on the top with the font size on about 72 points. We recommend that the name of the author appears below of the title with a smaller font. The different parts of the posters should be placed in different text boxes. That way is easier to handle them. Tables and graphs should have a medium font size to make it easier for viewers. The bibliography should have a small font size. If perfection is what you are looking for the creation of your electronic poster presentation, don’t hesitate to use our services to prepare your e-poster.